Apple has finally given business owners (and SEOs) a self-serve way to add or edit listings on Apple Maps. You can do it at MapsConnect.Apple.com. For over two years there have only been workarounds that don’t always work. So the recent news was good news. But you’ll still have to make sure your listing has the right categories – whether you’re adding a new listing or claiming and fixing an existing one. There’s not too much more Apple Maps SEO you can do, so you’d better nail your categories. There are 671 Apple Maps categories to choose from. You can pick up to 3. As you can see, it’s broken up into 3 columns. That’s because – as it is when you’re picking out your categories on Yelp and on other sites – you have to pick a category in the left column, then a subcategory in the next column, and then a sub-subcategory if applicable. Flip through the categories list and see if you can find your perfect 3. Any gripes about Apple’s category selections? Do they have a category for you? What’s been your experience with Apple Maps Connect so far? Have you seen any mention of when Apple Maps may support us poor, backwards fools in the UK? I just tried it and it says that the Apple Business Portal is not yet available in Canada. On the other hand, I tried adding 2 dental clinics and they were already there, apparently from Yelp listings. I should have mentioned that it’s US-only for now, but that Apple plans to roll it out soon to Canada and elsewhere. Phil – would you recommend creating an apple account for each client/business OR can you put all listings under one account? Haven’t tried this yet. I wouldn’t create all the listings in your account, as an SEO-er. That’s always been my advice, for Google Places and other listings. 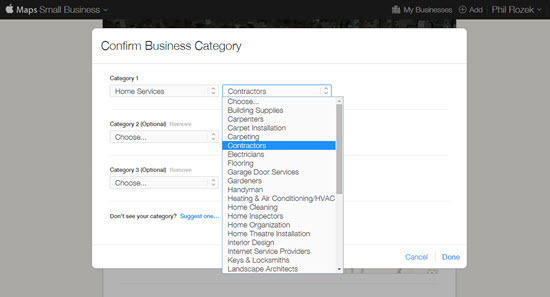 But if you’ve got a multi-location client, see if you can create several listings in one account. Can you explain why it’s best for us to keep our listings in separate accounts? Is there a limit on how many accounts an IP address can create? I just meant it’s best not to use your personal account to create or claim a client’s listing. The client should have control over his / her listing. Okay, that makes sense. If our clients do not have an Apple account and we put multiple listings in one account, would any problems arise? Only if you and your client part ways and they want control of their listings. Seems like Pet services is under nightlife? I’m thinking maybe it should be local services…? Good catch, Steven. Fixed. Thanks! “Pets” is actually a first-column (primary) category. I am optimistic. It is a step in the right direction. The phone verification is *%$^$. Mike mentioned on his post that some PBX phones or Google Voice numbers could experience problems. Yep. I can’t pin it yet to PBX or Google Voice. I have tried 3 business and all still show that verification needs to be completed. Even after receiving email from Apple that the info has been submitted. So I tried the calls again. Endless loop. That’s a bummer, Cody. Verification was a breeze when I tried it. Awesome news! Looks like Canadian businesses are on there, but there’s no dashboard available to manage a listing. My company listing showed up, appeared to have been fed in by Yelp. Yeah, I believe the self-serve feature in the works for Canada. HI, thanks for the info Phil!! I was able to verify one of my listings today. Apple will not verify forwarded phone numbers. In my case, I forward all to a central number. It’s easy enough to fix by just un- forwarding for the few mins it takes to verify. Good to know, Frank – thanks. Pick the closest you can. But let’s hope Apple improves the list over time. Should you use the Apple ID that the client uses for iTunes or set up a separate Apple ID just for the Apple Maps? I’d keep ’em separate if at all possible. So, set up a new Apple ID just for Apple Maps? Why wouldn’t it be “if at all possible”? Cindy, all I’m saying is that it’s generally best not to create business listings in a personal account. That’s frustrating, Don. But at least with my list you know that there is a category for horses, and where it is. 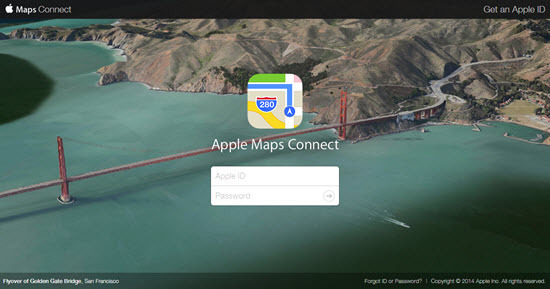 Just in case anyone hadn’t seen the news from last week yet, Apple Maps Connect is now available here in the UK as well as Australia, New Zealand, Ireland and Singapore. Just working on a post about it so will include your fab Categories list if that’s ok with you Phil. Yes, it’s all very Google-y! I have followed those instructions. I note that there is now an option to Remove from account. The map where Apple shows the map pin is horrible. Whenever hit the + key to scroll in, the map pin moves so you can’t really tell where to place the pin. Totally agree with Bob!. When I did mine, the entire section where my business is located was blank. All I could see was the pin – no detail! I had to keep scrolling in and out to get to the point on the map that I needed to be. Yes, I had one of those blank ones the other day too! You would think somebody would have said something by now! This is a great resource Phil. 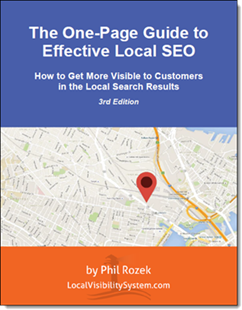 You have contributed so much to the Local SEO community, thank you!